Would You Like To Piss On George Bush? This Just In! Clark Sorensen, famed floral urinal designer, has apparently gone political! 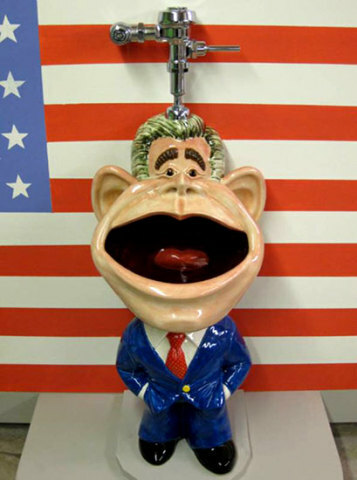 He's made a Presidential Urinal, the likeness of George W. himself! Sorensen, who will have a sneak pee-view of George at his San Francisco studio on election night, says he designed the Presidential Toilet so that he could express his appreciation for the last eight years. Visitors to his studio on election eve will be encouraged to give the urinal what it deserves -- "A Good Flush!" Following the sneak pee-k at his studio, Sorensen will have a one-man show entitled "Down The Drain - The Legacy of George W. Bush." at Ruby's Clay Studio and Gallery in San Francisco. The show will run from January 17 to February 16, 2009. For more information, visit ClarkMade. If you would like to attend the sneak pee-k, get a reservation by emailing him at clark@clarkmade.com. See more of Sorensen's Urinals in my former column: 10 Fun Ways To Piss On A Flower. Well, what do you think? Creative way to express an opinion or a new low in the political dialogue? Somebody needs to turn that into a flash game. I'm not even American..but I'm commenting to say, well, no comment. It's too funny.